The Spanish named the demonic plant peyote, from the Nahuatl word peyotl. It’s is a small cactus with fuzzy tufts instead of spines that rarely rises more than 3-4 cm above the soil surface, the largest part of the cactus being its long underground taproot. Peyote is native to southwestern Texas and Mexico, growing in scrubby desert and preferring limestone soil. Currently in Texas it has been over-harvested and its habitat increasingly used for ranching, to the point that peyote is listed as an endangered species. 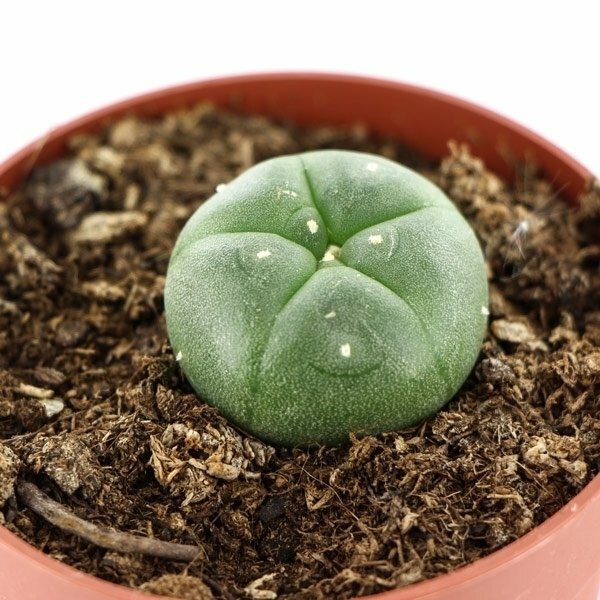 This is made worse by the fact that peyote is extremely slow growing, though cultivated ones grow faster, with mature, flowering and harvestable (approx 3 inches in diameter) adult cacti taking less than three years to grow from seed. Only in the 1900s did peyote publicly rear it psychedelic head again, with the establishment of the Native American Church and the legal protection it was given for peyote rituals. Aldous Huxley tried mescaline under the supervision of Dr. Humphrey Osmond in 1953 and noted: "This is how one ought to see, how things really are." Huxley published his classic Doors of Perception about his mescaline experiences the following year. Peyote is another of nature’s wonderful chemical factories, making more than 50 alkaloids. The most interesting of these is the powerful entheogen mescaline, which makes up about 0.4% of the fresh cactus and 3-6% dried. The bit of the cactus above ground develops disc-shaped "buttons" that can be sliced off. Anywhere from 4 to 12 buttons are cut and chewed either fresh or dried, or made into tea. Buttons should be sliced off at ground level or slightly above in order for new ones to grow. If you re-root your cactus by laying it in a porous, sandy soil or vermiculite/perlite mix and water regularly (allowing it to dry out between soakings), new roots will form from the cut base. Peyote is extremely bitter and most people feel nausea before they feel the onset of psychoactive effects. Try not to eat anything for at least 6 hours – you’ll keep the buttons or tea down longer and extract more of the mescaline before you (inevitably) empty your stomach. Once intoxicated, you will probably feel your body temperature and heart rate rise, creating sweating and flushed skin. Remain calm; this is normal. All general advice regarding powerful psychedelics applies (good set & setting, importance of an experienced guide or sitter if it’s your first time, not mixing with other medicines or alcohol, etc). Finally, have faith in the validity of your experience and try to integrate what you learn into your life. Peyote is a very special ‘helper’ plant and not to be taken casually.